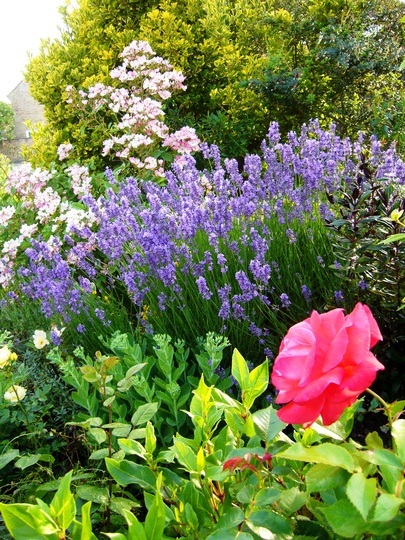 A blooming lovely garden :o) lovely mix of colour there your ballerina is great beautiful rose. What an entrance! Lots of lovely colours and shapes, TT, brilliant. Lavenders like this area which gets sunshine just about all day. Lavenders should be pruned (after flowering) to keep them neat and tidy - i don't think they tolerate their older wood being touched though so maybe that was all the problem was, Linda. I prune mine hard immediately after flowering and that keeps them a nice size aswell as shape. ... I do the same as Louise, and cut to shape immediately after flowering.. If you don't prune them, they often get top heavy, with lots of dry-looking branches at the base.. This looks lovely TT. You have a real eye for colour in your garden. My favourite lavender was looking straggly and woody last year, so I decided it really had to go. With nothing to lose, I took several cuttings and to my surprise they all rooted. My family and friends now all have lavender plants! However much we trim lavenders, usually, they do eventually outgrow their space and benefit from being started again from cuttings.... Your family and friends are the lucky ones ! Beautiful TT so glad to see a pic of the rose `ballerina` it looks as if it`s small and lax enough to grow and drape over a 14" high wall, which is what I would want it for. Cheers. Your lavenders have lovely colour! Lovely combination. Isn't the lavender supposed to keep the greenfly away? Your garden is so colourful & beautiful. I will be studying your photos carefully, in order to see how you have put certain colours together & how you have balanced it all out. Can I ask you which lavender this is? Thanks. Sorry I don't have the name of the lavender. It has been a challenge for me to have the flower beds with colour all year, and not only in springtime ! Lol. That looks amazing. Wish my front garden would look like that.